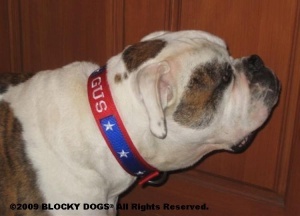 Blocky Dogs custom collars are made especially for large, bull breed and working dogs. We are proud to offer a custom dog collar from Blocky Dogs as part of the First Place prize package for our 2010 Proper Pit Bull Howl-o-ween Contest. Each collar is made to order and Rebecca, the owner, has thought of every last detail. For example, Blocky Dogs collars are designed with the ID Tag ring on the side. Why? We know people are sometimes afraid of our dogs. If your dog ever gets loose, the average person on the street might be unwilling to reach under your dog's chin to get a look at the ID tag. With this design, the ID tag is clearly visible on the side of your dog's neck. Remember "Gus", the lovable Bulldog on the TNT series Saving Grace? Blocky Dogs had the privilege of outfitting Gus for the show. Here he is wearing his 1.5" wide flat color with center stripe and special embroidery features. Gus first wore his Blocky Dogs collar for the August 11th, 2009 episode. And continued to wear it after that through the end of the final season. Below are the details for our Proper Pit Bull Howl-o-ween Contest prize. So, are you feeling lucky? 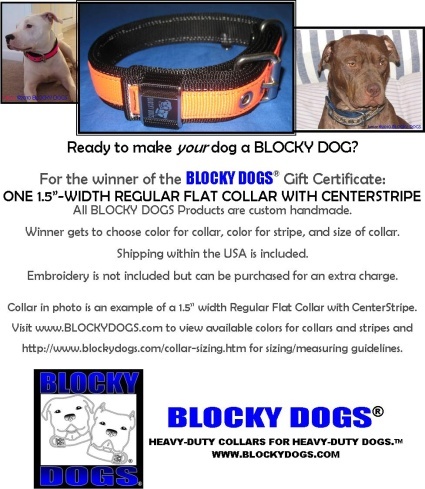 Go to the Blocky Dogs website to start picking your colors now! Return from Blocky Dogs Custom Dog Collar to Halloween Costume Contest. Return from Blocky Dogs Custom Dog Collar to Pit Bull home. Copyright© 2006-2010. The-Proper-Pitbull.Com. All Right Reserved.